It will be interesting to see which version of VR becomes more widely adopted. Each have their advantages and disadvantages and each has content that is better suited to that experience. Ultimately I believe room scale will become an important feature amongst the many others such as hand tracking, outward facing cameras, positional head tracking, basic haptics, screen resolution and refresh rate, portability, and then later things like eye tracking, facial expression capture, and the many other advanced technologies that have yet to be developed. Oculus is betting on the seated experience being the base level experience for VR, and while they are introducing their headset without hand tracking input, they will bring out their Touch controllers soon after release. With stationary (seated or standing in place) VR you don’t have to worry about users having enough space, and the setup is much simpler. In my experience with Rift CV1 and the Touch prototype controllers, the experience feels solid and versatile in that many types of games and applications could be developed to maximize this setup. The only thing I found really lacking was that the Touch controllers did not support full 360 degree usage, something that I think will quickly become necessary. The tracking cameras are both positioned in front of you for the Touch setup, this is to minimize occlusion of the controllers from the front, but as soon as you turn around to face behind you the controllers are no longer tracked effectively (at least in the prototype version). 360 is vital to VR and a lack of controller input in half that tracking volume is not really acceptable in the long term. What happens is you then have to constantly artificially rotate your avatar to face the front, which also requires awareness of physical direction, something that can quickly minimize the feeling of presence. The Touch cameras are not the only factor here though, the tether also contributes to this limitation and this is something that for now we will have to deal with in premium VR. Mobile VR doesn’t have to deal with this and that is one of the great advantages of that form factor, but I do believe there are ways to minimize this hindrance and include full 360 degree hand and head tracking. One possibility is VR specific seating that has the cable built into the chair using a slip ring that allows for full rotation without any risk of getting tangled in the tether. If you pair this with maybe 1 more tracking camera it would likely be possible to create an unhindered 360 seated experience, and this is where I think the minimum threshold should be set within the next couple years. HTC and Valve are betting on room scale being the standard for VR going forward and since I got my Vive Pre setup a few days ago I can’t necessarily argue with this idea. There is clearly a place for room scale, more so than I even expected with my limited time with the Vive before this. There will be certain types of experiences that are much better using a physical room for the movement space. One thing I noticed is that just the ability to freely lean and move in 360 degrees, or even take a single step left or right around a corner, is really compelling. But quickly you can see that room scale is still very small and unless there are solid techniques developed to overcome the space limitation, it is not going to be any better than seated as far as movement goes. Fortunately, many techniques have already been developed and are beginning to be refined. 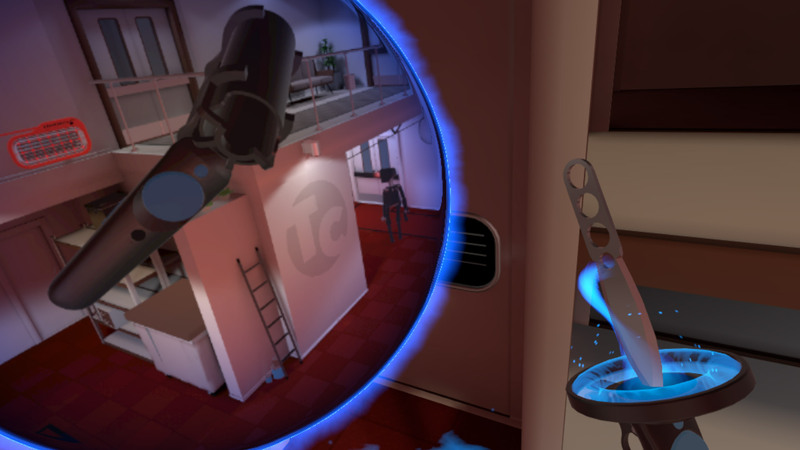 Most of these involve teleportation in some way, the most interesting of which is in the stealth game Budget Cuts which gives you a teleportation orb to sling around the environment. When the orb lands on the ground a small window to that new location opens in front of you. All you have to do is use your hands to grab the sides of the portal and pull it around you to step into the new location. This all feels very natural and sci-fi and works great for a game set in that type of world, but I’m not sure it would feel as fitting in other worlds. We plan to release a Vive room scale version of The Night Cafe shortly that will use a teleportation technique that we hope we can aesthetically blend into the experience. In addition to teleportation, there will also be many experiences developed to restrict the space to only that room so as not to require movement outside of it. This is actually more compelling to me in many ways because it really exploits the potential of this form. 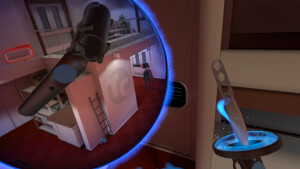 Games like Fantastic Contraption show this very clearly, not only as a fun gameplay experience, but you can easily see how the control mechanics they are inventing here will be used in many other types of applications from 3D modeling and CAD to other productivity applications that require manipulation of 3D objects. The ability to build a 3D object in room scale and to take steps around your object is quite mind blowing. Being that it is still very early in the development of both of these technologies, many things have yet to be fully defined and many things will still be invented. I can imagine a hybrid of the 2 that allows you to occasionally get out of your chair and take a few steps around before returning to the chair for a seated experience. I think that a stationary, seated experience allows for a greater ability to expand the boundaries of a 3D space. Although, in a way, the ability to artificially move with a control stick rather than physical steps can be more immersive in that it doesn’t force you to constantly consider if you can make it from point A to point B without bumping into a wall. That said, in those moments when you can just focus on your immediate surroundings in the virtual world, there is nothing more immersive than room scale. I think room scale is an important addition to VR and will become standard in all major headsets in the not so distant future. Palmer Luckey has even mentioned that Rift can do room scale if you position the cameras in the right places, although most content for Rift will not be designed with this in mind. If I had to make a feature list of VR in order of importance I would say: Solid rotational head tracking, high quality displays and lenses, positional head tracking, hand based input (360 degrees preferable), simple haptics, room scale movement, eye tracking, untethered headsets… And after that there will be new features that will surely keep improving the experience, but as you can see, the major players are checking the boxes one step at a time to bring greater and greater immersive potential to VR, so I think we are already establishing a pretty good base level.